The SDR-IQ™ is a 14-bit software defined radio receiver. It offers a broad range of spectrum analyzer and demodulation capabilities. Processor: Atmel AT91SAM7S256 w/ JTAG port. Max IQ Recording (All BWs): Unlimited to Hardrive. 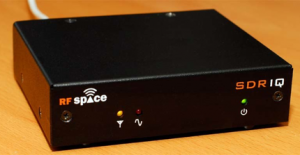 This entry was posted in Made in USA, RFSpace, Software-Defined Radios (SDR) and tagged Made in USA, RFspace, RFspace SDR-IQ, RFspace SDR-IQ Reviews, SDR, SDR-IQ, Software-Defined Radio. Bookmark the permalink.